The 1970s was the age when technology came to the home. It is difficult to imagine now how exciting ideas such as pocket calculators, digital watches and video tape recorders were back then. In 1969 we had watched man land on the moon and witnessed the first flight of Concorde. In the 70s the technology that drove these groundbreaking events also started to shape our daily lives. The future looked bright, even though the economic outlook for the decade was gloomy. 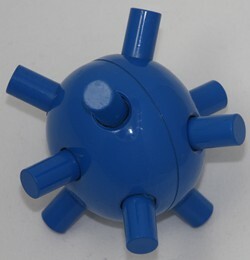 Does anyone remember the Fingermajig? Although almost forgotten now, the Fingermajig was designed by Jorma Vennola in 1970 and manufactured in Finland. It was originally intended to help disabled children get good finger exercise, as well as being a fun item for children to play with. They were sold in general toy shops later in the 70s. Few people knew what it was at the time. I recall debating with my parents whether it was meant to be a representation of Sputnik 1 or a sea mine (it would float in water as well). Of course such an intriguing item held appeal to adults too. Peter Sellers was pictured playing with one on a TV interview in the 70s. It was all change for our small change in 1971 when decimal currency replaced the old pounds, shillings and pence. Some people needed a little help to work out the new prices. With the 'Decimeter' conversion device you could make sure you were not being ripped off at the checkout when prices were converted over to decimal currency. The BBC first broadcast television programmes in colour in 1967, but sets were prohibitively expensive. People, however, were quick to see the benefits of colour and over one million licences for colour sets were issued in 1972 and by 1976 more people were watching television in colour, than in black and white. The TV set on the right is a Dynatron Copenhagen CTV10A from 1972. Dynatron was a luxury British electronics manufacturer which had the Royal Warrant. Their TVs were the top end in luxury at the time and boasted a cable remote control system (left). The cabinet is in a fashionable Scandinavian design finished in teak. The ability to record TV programmes and watch them later was little more than a dream for most people in the 70s. 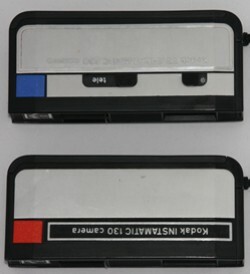 The first commercial video recorder, left, was the Philips N1500 from 1972, which used a proprietary format called VCR and could only record one hour's worth of programmes. However, the cost of these early VCRs meant that few people had them in their homes. You were more likely to see one in a school or in a university. By the end of the 70s, people were buying VCRs for home use. There were a number of competing formats. Beta was launched by Sony in 1975 and SVR by Grundig in 1977. The system that eventually won out was JVC's VHS which offered three hours of playing time. No 1970s home would be complete without a stereo system. 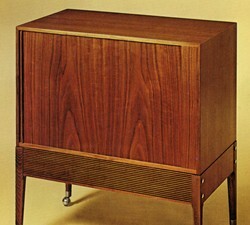 Back in the 60s it was only Hi-Fi buffs that fiddled around connecting tuners, amplifiers, turntables and speakers. Most people had to manage with a radiogram which combined everything in a single cabinet. In the 70s you could buy systems off the peg with separate speakers. 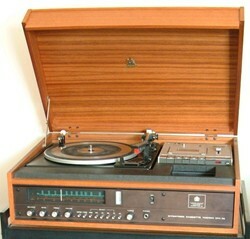 Dynatron went one stage further in 1972 and combined a tuner, amplifier, turntable and cassette deck in one single box with separate speakers. A few years later this kind of system would have been called a music centre. Dynatron never used this term, which became associated with more downmarket equipment. Texas Instruments (TI) was the company behind the first integrated circuits which are the building blocks of all modern computer technology. 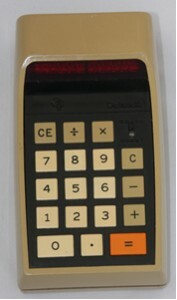 Although they developed the technology, TI worked with the Japanese consumer electronics company Canon to make the first commercial hand held calculator, the Canon Pocketronic in 1970. TI did not make their own calculator until 1972, the TI-2500 or Datamath. This version, left, is for the UK market and dates from 1973. Although far from the smallest calculator, the Datamath became a big seller. It was a designed product, unlike many other calculators of the time. The gently curving case makes it quite different from other calculators and its sloping display suggests it was just as likely to be used on a desk as held in the hand. Ronson pioneered innovative ways to light cigarettes, pipes and cigars throughout most of the twentieth century. They patented a new type of cigarette lighter in the 70s which used Piezoelectricity. Piezoelectricity refers to the electric charge that certain minerals can generate if a mechanical action is applied. It is the same technology that is used in electric gas lighters. No battery is normally needed. 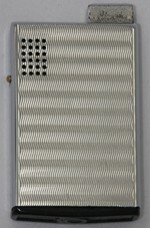 The Varatronic was popular because it was efficient and easy to use. At the same time it lent a little modern glamour to cigarette smoking which was increasingly being viewed as unhealthy. Kodak pioneered easier ways to take pictures ever since the original box Brownie cameras of the early 1900s. In 1963 the firm introduced snap-in Instamatic cartridges and a new range of cameras taking Instamatic film. In 1972 they invented a smaller format called 110. In 1975 Kodak asked Kenneth Grange to restyle the 110 camera range for the European market. His designs were neat and modern. They allowed Kodak to sell a range of cameras, some very basic, some offering advanced settings such as telephoto lenses, but all with a similar look and feel. Illustrated left are the Instamatic 130 and 330 designed by Grange. The Trimphone was the ultra modern telephone of the 70s. The design of the original dial version went back to 1964. However, the GPO upgraded it in 1976 and asked for manufacturers to make a push button version. The only way to get a telephone in the 70s was to rent one from the GPO and to get one of these you needed to pay an extra equipment rental charge. By the middle of the 70s basic calculators had dropped significantly in price. The race was on to produce the smallest possible models. The target was to be no bigger than a credit card. Casio won the race to make the first credit card sized calculator, the LC-78 (right). It is actually slightly bigger than a standard credit card. For this to be possible the red LEDs had to be replaced by something smaller and less power hungry. Manufacturers had experimented with LCD displays from the beginning of the decade and the first calculators using them started to appear around the middle of the 1970s.